A Comenius Assistant in Greece | Nine months as a teacher in Attica. Nine months as a teacher in Attica. I’ve been back in the UK for two months now, and Greece already seems like a dream. Next week I’ll start my PGCE at King’s College London, where I’ll get the chance to put my Comenius practice into action! I miss so many things about Greece – the sunshine, the sea, the people, the food. I miss speaking the Greek language and learning more about it every day. I even miss the terrible Greek tv (Τα Μυστικα Της Εδεμ, Ονειρο Παγιδα, Κατι Ψινεται etc!). I can’t wait to go back for a holiday! My final weeks as an assistant were hectic but great. I took part in a dance show with my class, helped my pupils contribute some songs from Oliver! for their end of year show and visited Naxos with my sister. Naxos is perfect for a summer holiday- I’ll definitely go back! I’ll leave the blog up for anyone who’s considering applying for an assistantship. Seriously, if you’re dithering, DO IT. It’s not an easy ride – I experience the steepest learning curve of my life, personally and professionally. I was lonely and miserable at times, even though my colleagues were endlessly kind. Learning Greek in a short period of time was really intense! BUT, overall, I had a really wonderful experience that I will treasure for the rest of my life. To become part of a community in another country is a very special opportunity, not to mention the chance to develop teaching skills in a unique environment. If you want to be a teacher, a Comenius assistantship is such a fantastic way to start your career. Go out on a limb and choose an unusual European country – learn a language you haven’t studied yet – give your host school the chance to work with a native speaker and in return you’ll learn so much. What with my various visitors and hanging out in Athens by myself, I’ve discovered a few favourite restaurants and thought I’d pass on my recommendations. TO HANI (Adrianou, Plaka) – A fairly cheap, touristy restaurant in the Plaka. It’s a good place to try some Greek classics, like pastitsio, dolmades or moussaka. TERINA (Karnikareas, Plaka) – Sit in the shady square and enjoy a modern take on classics and island specialities. I enjoyed the Terina salad, with chicken, apple and spring onion. The ladotyri is also good, but as it’s esentially a 300g block of cheese in a delicious sauce, you may want to share it as a starter. On the pricey side but nice. May has many traditions associated with it, in Britain and in Greece. At school we celebrated the first of May with some traditional British Maypole dancing which I set up for the children. It was a lot of fun and the kids really enjoyed it! We used the volleyball nets and some cheap ribbons to make two maypoles, and I found the music (I recommend the Yetties for some good old-fashioned folk). 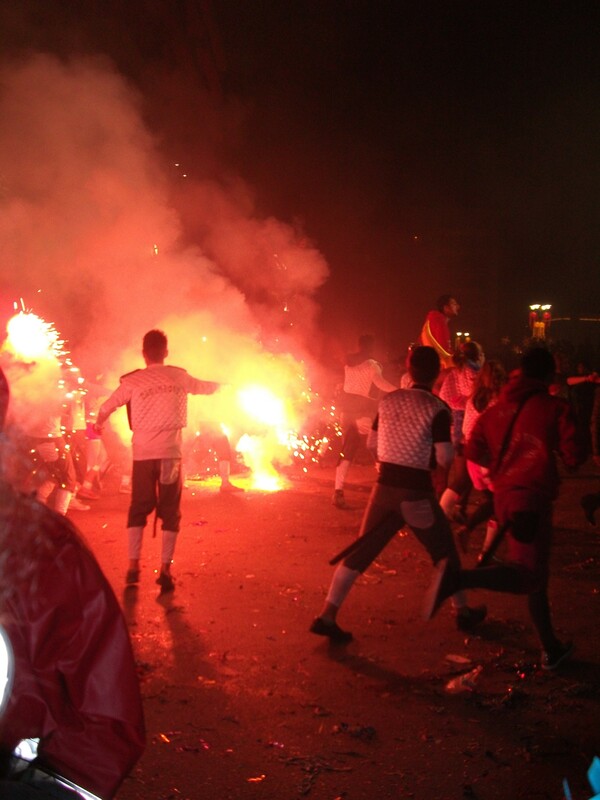 Of course, this was followed shortly by that other May tradition – strikes and riots. Although I was removed from the drama up here in Attica, I was glued to my TV and twitter as Athens descended into violence on May 5th. 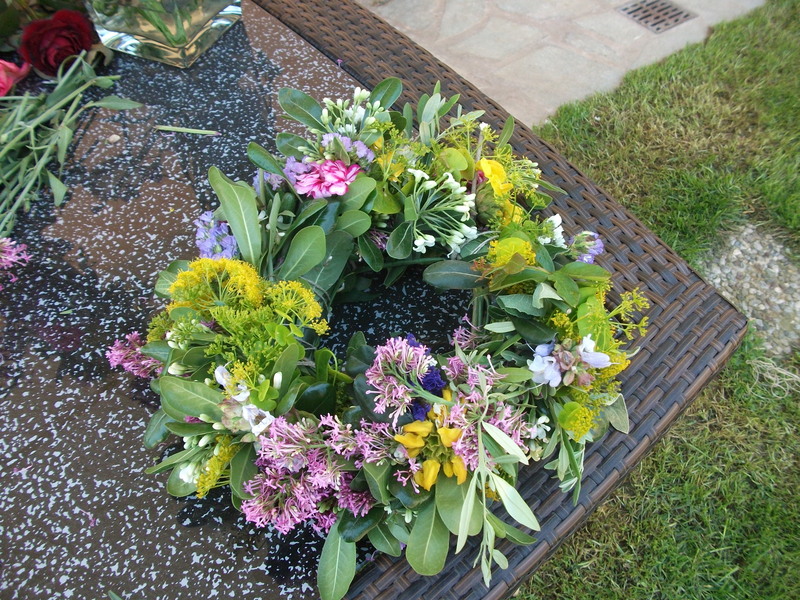 A happier Greek tradition is making stephania, flower wreaths that are hung over the doorway. I got to make my own and it was a lot of fun! It’s currently above my front door waiting for the festival in mid June when the wreaths are burned. 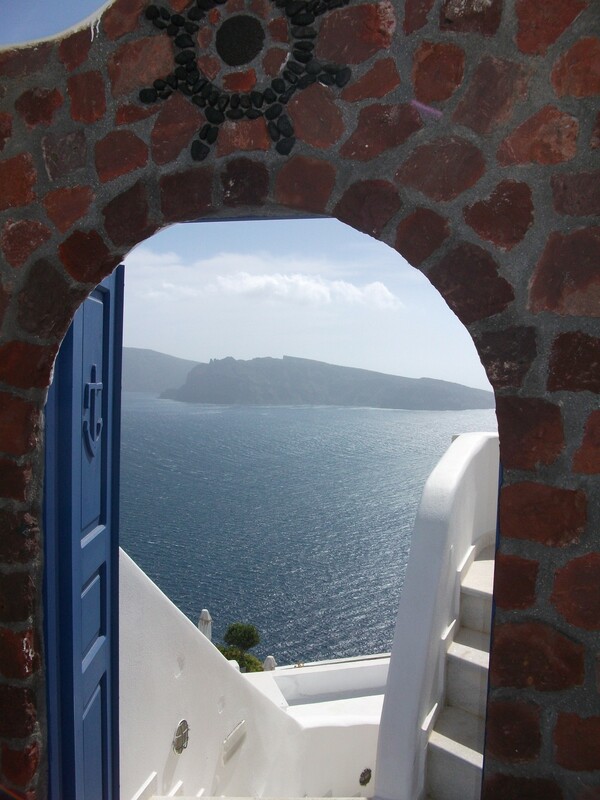 The other great thing I did in May was visit Santorini – which deserves a post of its own if I get the time! Only two weeks left of my assistantship…can’t believe it. Time has zoomed by! I’m also super busy. We’re preparing pieces for the yiorti (fete) and I’m doing some songs from Oliver! with Year Five, I’ve got a performance with my dance class and the end of year celebration for my Greek school. Plus I’m giving some extra lessons to my pupil Joanna and doing lots of writing, as well as hosting some friends! Over the two week Easter holiday I had a fantastic time here in Greece playing host to my boyfriend Dave and then my parents. It was slightly strange to be back in tourist mode again. 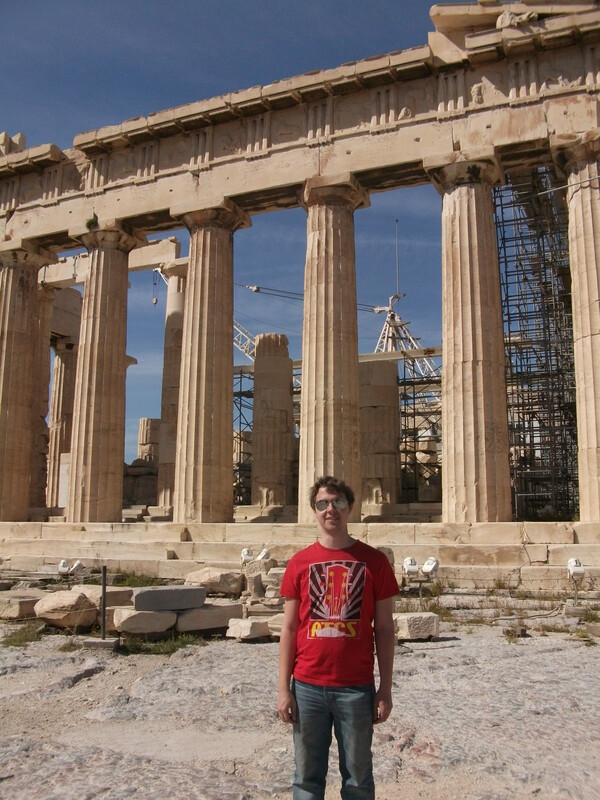 It reminded me that my first trip to Athens was nearly seven years ago (seven?!!!). In fact my parents and I stayed in a hotel just round the corner from the one I first came to with my school (The King Jason on Kolonou). I had a fantastic 4 day trip last week to the north of Greece in the company of two other assistants, Ana (from Spain, an assistant in Athens) and Catarina (from Portugal, working in Katerini). I started Greek dancing lessons this week and thoroughly enjoyed myself. It’s a very social form of dance given that you hold hands with the people either side of you, so even though the average age of the group was about 50 it was lots of fun. The teacher didn’t introduce me until about halfway through, when the whole group applauded at the notion that a British person might want to learn Greek dance! The only one I can remember the name of is unfortunately the most boring, but to get a flavour of what we did here’s a video of the Sampson dance. Apokrias ended last week. It’s the build up to Lent which in other countries is celebrated as Mardi Gras or Carnival (which has a similar meaning to Apokrias – farwell to meat). Why cram all that feasting and partying into just one or two days, though? Greece has three weeks of festivities. Tsiknopempti is one of the special days of Apokrias, when people grill meat to release the ‘tsikna’, the smoky smell. That day I went to the school’s fancy dress party – fancy dress is a big part of Apokrias and led many children to call it their ‘Halloween’. Last weekend, the final weekend of Apokrias, is the time for a serious party! 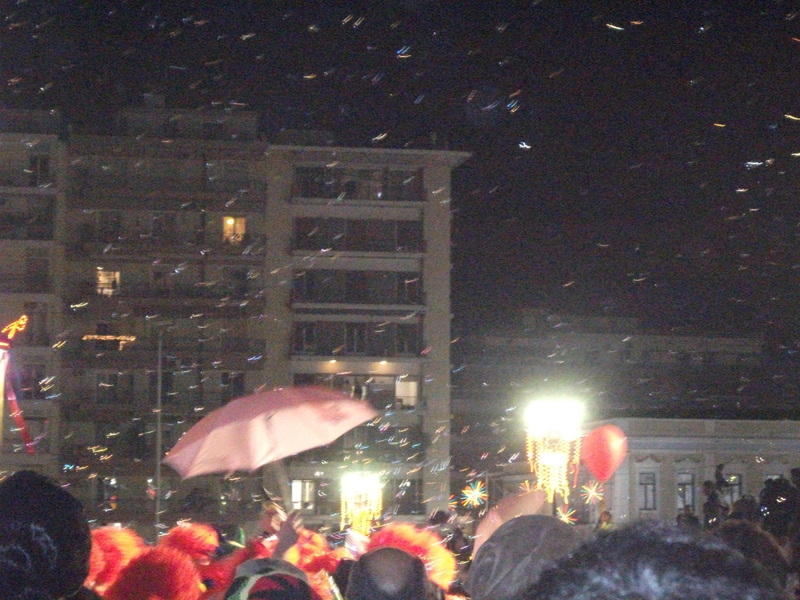 I was lucky enough to go to Patras for the first day of their world famous carnival. 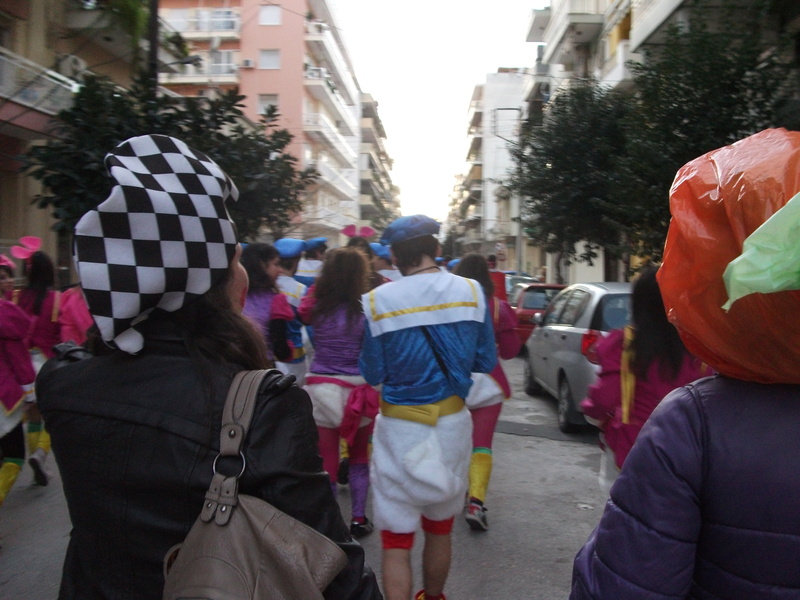 We saw hundreds of townspeople dressed in costumes ranging from Donald Duck (above) to brides, from shepherds to aliens. The party is fuelled by a sweet wine called ‘mavrodafni’ (μαυροδάφνη) that’s available in nearly every shop. After the carnival weekend it’s Clean Monday, when kids fly kites (ours made theirs at school). So now it’s Lent! At least one teacher at my school is going totally vegan for the period, which is traditional for Orthodox Christians, so I think the party period is justified. The Greek school system has no formal inspection body (like Ofsted), but instead has a sort of peer review system by which teachers from the region are invited to observe other teachers. This week myself and my mentor Areti hosted two observation sessions for teachers from Attica, with the goal of showing them how a language assistant can be used in the classroom. We were supposed to show an ordinary lesson from the textbook, so with yr 6 we read an email about visiting a flight museum and discussed war museums in Greece and Britain. With yr 5 we took an environmental quiz to find out how good we all were at looking after the planet! We also incorporated a little of the cultural side of my assistantship by recapping a previous lesson in which I showed some pictures of Oxford. The feedback was very positive and I think the other teachers were enthusiastic about the idea of having an assistant, although I did have to warn them that native speakers of English might be hard to come by (I’m the only British assistant in Greece this year). Many commented that it was beneficial having a native speaker to get the children used to a native accent in both speaking and listening. One teacher, however, was a bit sceptical and wondered, ‘is a good accent really what we are aiming for?’. This is clearly a view shared by the Greek ministry of education, whose English course CDs are frankly dreadful. Rather than using English or American voices they use Greek ‘actors’ who speak with a dubious ‘international accent’ which is often unintelligible to me, let alone to the kids. The worst bits are when they have a ‘French’ character, played by a Greek actor, speaking English with a bizarre French-Greek accent. I can understand that they don’t want to give priority to one sort of English accent over another, but I believe that this viewpoint is hampering the kids’ ability to develop good communication skills. The real question should not be ‘are accents important?’ but ‘why are we teaching English?’. If the purpose is just so the children can gain xyz certificate then sure, they can use whatever accent they want. However, if the purpose is to open up a new world of communication for their future lives – be it for travel or work – then they will need to be able to understand native English accents. They will also need to speak with a clear pronunciation that allows the other person to understand what they are saying. Pronunication can be key in English because it’s full of heteronyms – words that are spelled the same but which have different meanings when pronounced differently – e.g. lead the metal and lead a horse to water. I’m not saying that they need to mimic my London accent, but if I can help them achieve good pronunciation of certain words and sounds which seem to be more difficult for a Greek person to reproduce (‘h’, ‘sh’, ‘ch’ etc.) then I think it’s worth my input. In case you were wondering, they enjoyed seeing pics of Oxford and will from now on remember the Bodleian Library as ‘the library with robots’!!! My first term is drawing to a close – only a little over one week to go! If asked to give my opinion honestly, I would say I have had a very interesting experience so far – but it’s also been extremely hard. I still don’t have any friends (apart from my fellow teachers, who have been very welcoming), and I spend my free time on the internet blogging or watching tv (now that I’m no longer writing my novel). It’s just not possible for me to do more. On a more positive note, I am looking forward to doing some fun Christmas things with my kids this week. We have already sung some good songs (‘Santa Clause is Coming to Town’ and ’12 Days of Christmas’). On Tuesday the English subject supervisor will be visiting, so I hope to use an exercise I’ve created to introduce the kids to a ‘British Christmas’ (a short text explaining what we do on each day, and a table for them to put the info into). There was an awkward moment the other day when two children that I’m teaching privately asked me how it was possible for Agios Vasilis to bring presents to Greek children and Father Christmas to visit Britain. I had to tell them the truth, of course – that the two bearded men are good friends who live and work together in Lapland! Apparently this confusion over the role of their traditional present giver and that of the more globally recognised Santa is widespread. My year 6 pupils assured me that Agios Vasilis was a real person (but then again, so was St. Nicholas…), which seemed to be their means of making a distinction. However, I can’t help but wonder if the clash between the two saints makes some children more cynical than those who are never exposed to a rival tradition. Of course, the British/American tradition is not exactly untouched by the ravages of time/globalisation/commercialism. Father Christmas used to wear green until Coca Cola kindly provided him with a new, bright red outfit. I’ve been slacking off on my Greek SRS practice. SRS stands for Spaced-Repetition-System, and it’s advised by many language learners including Khatz. I was using Mnemosyne for a couple of months and managed to enter about 80 sentences from greektionary.com and a couple of other sources (like the Τα Μυστικα Της Εδεμ website! ), but because of NaNo and generally feeling bored with it I stopped doing my reps.
Today I downloaded Anki instead, because it has a much easier interface for adding audio. Because the greektionary.com site offers audio downloads of all its sentences, I figured it would be useful to translate from the sounds of the sentence as well as the Greek words. Sentences gathered from text can be inputted in a traditional Greek/English format. I’m starting from scratch with a new deck too, because I want to find more motivation with this one and pick up the pace with my Greek learning. I will be adding sentences from my textbook (Τα Νέα Ελληνικά για Ξένους if you’re curious). Violence has erupted again in the centre of Athens on the anniversary of the killing of a teenager by police. I highly doubt it will reach us up here though, so don’t worry!